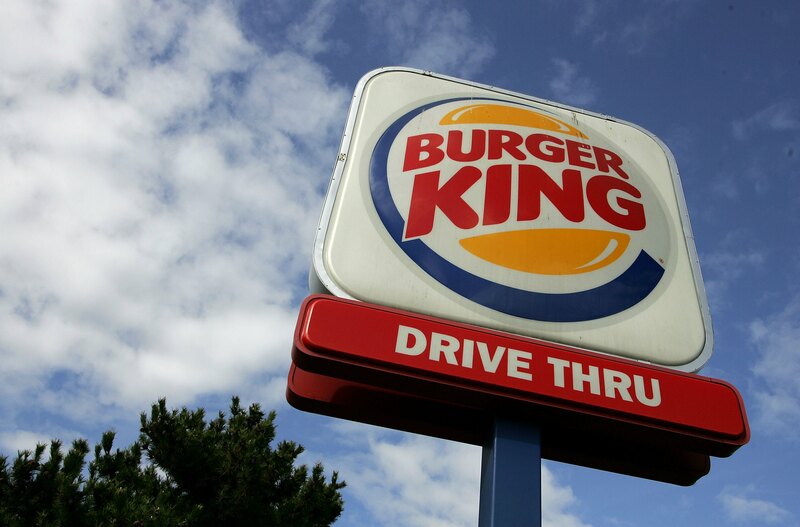 Burger King has always been the odd fast-food joint out, but the restaurant chain might finally acquire its kingdom. The New York Times reported that Burger King is closing a deal to purchase Tim Hortons, a Canadian doughnut-and-coffee franchise that's super popular in Canada — seriously, it's bigger than McDonald's there. If these two restaurant chains merge, be prepared for having a Whopper with a side of glazed jelly doughnut. 3G Capital, which acquired Burger King in 2010, is in "advanced talks" to purchase Tim Hortons for more than $8 billion, according to The New York Times. However, Bloomberg Businessweek places the figure at more than $12 million, when accounting for cash and stock. When the deal is finalized, it'll be the largest acquisition of a restaurant chain in history. Really — the deal is so large that billionaire Warren Buffett will allegedly provide some of the financial backing via shares. So, what would this merger mean, exactly? Well, it's very possible that fast-food hybrids are in our future (I wasn't kidding about the glazed jelly doughnut side). According to The Times, Burger King's talks of purchasing Tim Hortons is an obvious sign that the burger chain is serious about diversifying its fast-food menu. However, that doesn't mean Burger King will automatically dissolve Tim Hortons. The burger chain will mostly likely go down the same road as Yum Brands, which owns Pizza Hut, Taco Bell and KFC. You know all those late college nights you've spent at the local Pizza Hut-Taco Bell joint restaurant eating bean burritos with personal pan pizzas, then waking up the next day wondering whose bright culinary idea it was to put processed Mexican food with processed Italian food in the same place? Yeah, it may be like that. While it may not be such a good idea for your stomach, business experts seem to agree that the merger is a smart more for 3G Capital and its CEO, Daniel Schwartz. "These guys will change consumer goods and food service forever and other CEOs know it," Ken Harris, managing partner at Cadent Consulting Group, told Bloomberg Businessweek. Plus, the merger will finally allow Burger King to jump into the coffee game, which is currently dominated by chains like Starbucks and Dunkin' Donuts, the latter of which is partners with Baskin Robbins. It may also give McDonald's some more competition among the early-bird crowd, who flock to the chain's iced coffee and hash browns. But not everyone is excited about the thought of a Burger King-Tim Hortons joint. Ohio Sen. Sherrod Brown released a statement on Monday urging Congress to take action against the acquisition because he believes it's a way for Burger King to avoid paying domestic taxes. Burger King’s decision to abandon the United States means consumers should turn to Wendy’s Old Fashioned Hamburgers or White Castle sliders. Burger King has always said ‘Have it Your Way’; well my way is to support two Ohio companies that haven’t abandoned their country or customers. To help business grow in America, taxpayers have funded public infrastructure, workforce training, and incentives to encourage R&D and capital investment. Runaway corporations benefited from those policies but want U.S. companies to pay their share of the tab.